Just a quick post for you guys mainly to show off my new bits and pieces and how amazing well they go together! The dress is amazing Bill and Mar Marble print which is similar to what I wore at Cosmo Blog Awards but in shorter form and brighter colours. I teamed it with this amazing fluffy jacket from H&M which I just couldn't resist buying! I felt it looked great with the dress and it all worked amazing with my new personalised Zatchel, I was lucky enough to be invited to their boutique opening in Westfield recently and chose the solar sparkle satchel which has my name and two shoes one pair engraved on it! 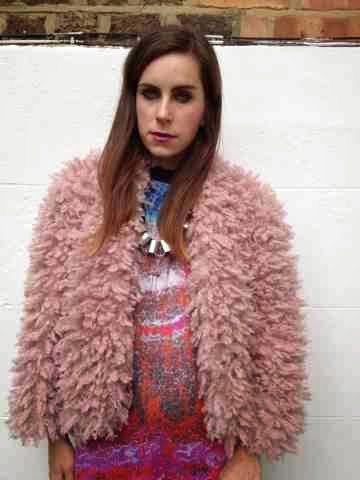 Accessorised the look with my chunky silver necklace, and my Argo boots for that tough look against the pink fur. 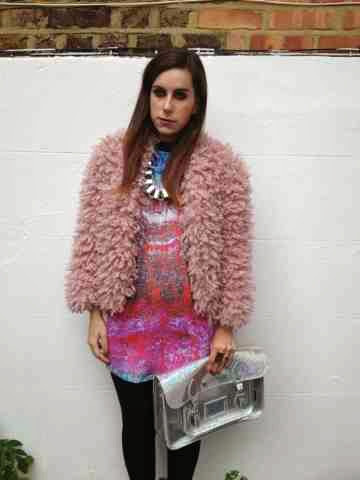 I absolutely love this look and think the colours and textures work perfectly to brighten up a dull and miserable day! What are you wearing to cheer yourself up in this weather? I am in love with that jacket! And the whole outfit is perfectly styled as always.